Registration for everyone and got an RFID tag with RM20 deposit. The RFID tag is the passes for us to the party and linked to respective Facebook account. It is for the game on the beach later. One of the lady who was helping us to register. All these buses sent us to the secret party location. 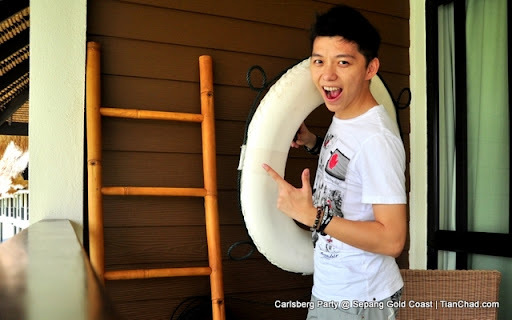 Some people guess the party location is Sunway Lagoon, Port Dickson or even Sepang Gold Coast. ChunkyMunky the 'tour guide' did make the trip to Sepang more fun for everyone. Played ice-breaking game to remember every other media in the bus. He and his buddy are funny too. After 1 hour++ we've reached the party place - Sepang Gold Coast's Golden Palm Tree! From L to R: DJ Maxine Hardcastle, DJ Charlotte Narni, DJ Ms. Pink, York Spencer [Marketing Director, of Carlsberg Malaysia], Soren Ravn [Managing Director of Carlsberg Malaysia], Gary Tan [Sales Director of Carlsberg Malaysia], Kenneth Soh [General Manager of Luen Heng F&B Sdn. Bhd. ], DJ Catherine McQueen, DJ Sam Cooke, DJ Kellie Acreman. One of the media asked why no hunk DJ playing for the night. Haha! Can you see how the DJ are so interested to Hua Chee's fashion? Everyone were grabbing chance to take photo with all 6 gorgeous DJs. So do I! Luckily I wasn't that short or they had lower their height when wanna take photo. The media is the first to arrived and followed by all party animals~! They had warm welcome by Carlsberg Crews, Soren Ravn himself and the host of the day Joey G & Patricia Suelin Knudsen!! There were many outdoor games awaiting us at the beach. All right Part 1 of Where's the Party by Carlsberg has end. What happen next? Stay tuned for next post~! You can see more photos on Carlsberg Facebook page now!